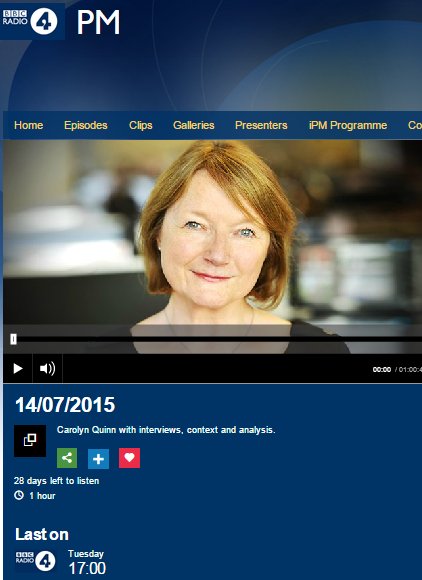 BBC has provided extensive coverage of the P5+1 deal with Iran which was closed on July 14. Those familiar with BBC’s track record on that topic would not have been surprised by the tone and content of the reports. The edition of the BBC Radio 4 programme ‘PM’ broadcast on the day the deal was announced included analysis (starting at 14:54 here and available for a limited period of time) from the person ultimately responsible for all the corporation’s Middle East content, Jeremy Bowen. The Middle East editor’s conversation with presenter Carolyn Quinn included some interesting between-the-lines messaging. 1) Downplaying Iran’s role in the Middle East’s ongoing conflicts and the impact that the deal’s lifting of sanctions and cash influx to Iran is likely to have on regional stability. Bowen’s dubious portrayal of the IRGC as though they were a bunch of naughty schoolboys is telling enough but his presentation of an Iranian regime concerned about and influenced by domestic public opinion obviously ignores the fact that even when economic sanctions were affecting the Iranian people most severely, the regime still found the funds to sponsor assorted terrorist proxies in the region, to intervene in regional conflicts and, of course, to develop its nuclear programme and military industries. 2) Promotion of Israel as the belligerent party and the notion that conflict has been avoided – rather than at most postponed. You know I think that this is actually a pretty spectacular diplomatic achievement. Ah…two years ago when Israel was threatening to bomb Iran’s nuclear…ah…installations and it seemed as if – even though Netanyahu was sort of reluctant to do it – they were on that course, it looked two years ago as if that was going to happen and now it looks very, very…it’s not going to happen actually. It’s not. The Israelis are not going to do anything like that at this point. Err…and to go in the space of two years from looking at what seemed to be a dead cert Middle East war into a diplomatic achievement, at a time especially when the Middle East is so full of turmoil, is a major diplomatic achievement. In 2013 Bowen similarly portrayed Israel as the belligerent in a report promoted on several BBC platforms. Speculations concerning the likelihood of an Israeli strike on Iran’s nuclear facilities have featured in BBC coverage since at least early 2012 – see examples here, here and here. 3) Promotion of the notion of a ‘moderate’ Iranian Supreme Leader. The biggest problem the agreement faces right now are hardliners in Washington and in Tehran. In Tehran the Supreme Leader is likely to deal with those hardliners. They wouldn’t have made this deal if the Supreme Leader Khamenei had not been behind it. Bowen did not clarify to listeners that the terms of the deal now conform to conditions set by Khamenei back in April and provide sanctions relief for some of those very same “hardliners” who “make trouble in the region”. Neither did he point out that nothing in this deal has brought change to Iran’s long-standing approaches and policies. Bowen’s messaging – and omissions -provide useful insight into the BBC’s editorial approach to the presentation of this agreement to its audiences. Hadar Sela Hadar heads CAMERA's affiliate BBC Watch.